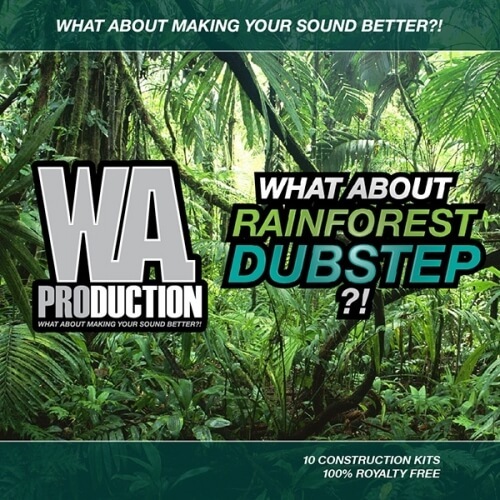 ‘What About: Rainforest Dubstep‘ is a brand new, exclusive pack from W. A. Production, that contains 10 massive Dubstep Construction Kits which mix Ethnic music and Dubstep. You’ve never heard about this connection in Dubstep music? Well, that’s why W. A. Production created this awesome pack. Featuring original ethnic instruments, majestic synths, MIDIs, drum, FX and vocal samples, and much more. All 100% royalty-free. Many variations of ethnic vocals, flutes, harps, guitars and strings are aviliable in this product. Everything is perfectly mixed with the biggest and fattest Dubstep sounds. ‘What About: Rainforest Dubstep’ contains plenty of drum samples together with big FX loops, vocal shots and a great collection of MIDI melodies. Every single track has a different body, verses, builds-ups and drops to offer you as huge a scale of Dubstep style bangers as possible. This product was inspired by the biggest names of the Dubstep scene such as Skrillex, Kill The Noise, Nero, Flux Pavilion, KOAN Sound and many more. What about making your Dubstep tracks more ethnic?